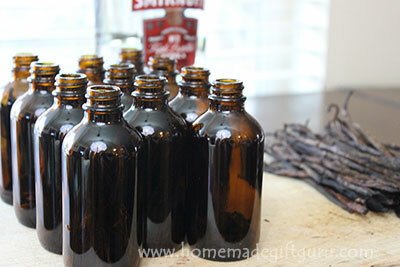 If you are interested in learning how to make vanilla extract for homemade gifts, you've come to the right place. I know of two ways to make vanilla, and they both have their perks. If you haven't already, you can check out the first of these two homemade vanilla recipes for a nice bulk supply. I do this every year, so I have plenty of homemade vanilla handy, for last minute homemade hostess gifts and for all my baking. Vanilla typically takes a minimum of 4 weeks to become infused (and I like to steep my vanilla beans quite a bit longer). Sometimes when making gifts, this can be a problem, but no worries... with today's method, there's no wrong time to make vanilla! 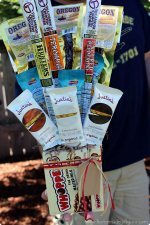 You will want to prepare for this homemade gift project by purchasing vanilla beans in advance, either from the supermarket or online. You don't have to spring for grade A beans, the less expensive grade B beans are actually preferred for making vanilla. 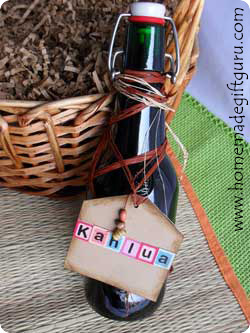 ...you will also want to either collect some high quality bottles or buy some in advance (I used these bottles for this tutorial, they are perfect for this project and come in a package of 12). As a bonus, vanilla made this way gets stronger with age, and can be topped off with more vodka as the vanilla is used, for a lovely bottle of continuous brew, everlasting vanilla extract! 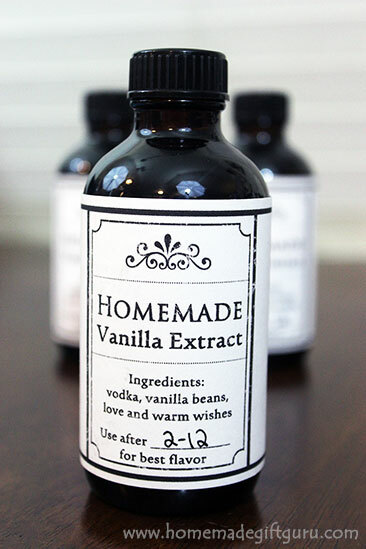 The following tutorial will show you step-by-step how to make vanilla extract that will continue to get richer and is perfect for gift giving. Homemade Vanilla Labels. The date goes right on the printable labels. Whether you make these gifts in advance or right on the day you give them, you can easily fill in the date accordingly (more on steeping time below). 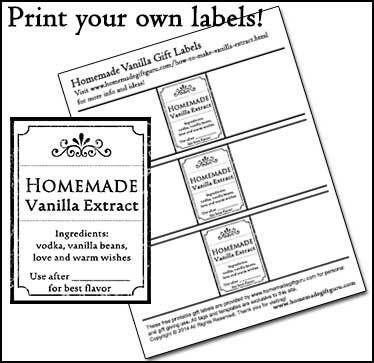 Feel free to use these free printable vanilla labels, provided for your personal and gift giving use. Instruction Tags. Your gift recipient can keep topping off their bottle of vanilla with vodka as they use it. The beans will continue to steep and deepen the flavor for years to come. 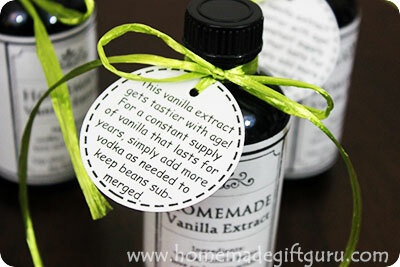 For this purpose, I made some vanilla instruction tags, which you can attach to each of your homemade vanilla gifts. 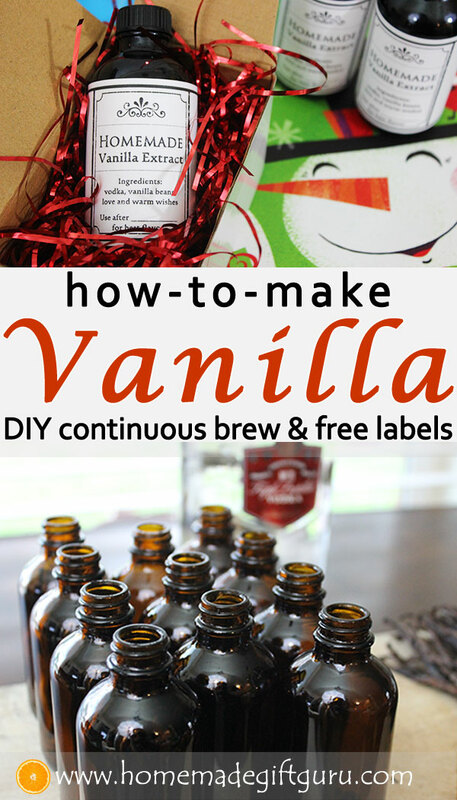 Click here to open and print these free homemade vanilla extract labels! ...I like the 4 oz bottle size shown here and use 4 beans per bottle. ...I choose middle quality, not bad but not the best. 1. Wash Jars. Wash each jar and all lids with warm soapy water. Rinse well and allow to dry. Method 2: use scissors to cut each bean down the center. Then cut each piece in half or thirds to fit inside jars. They look so pretty right now but honestly, once the vanilla steeps for a while, you won't be able to see anything inside the jar. *I prefer the chop method because it's easiest and I like that the beans sink to the bottom, keeping them well submerged if you can't top it off right away. 3. Put Beans in Jars. Insert desired amount of chopped up vanilla beans into each jar. 4. Add Vodka. Using a funnel, fill each jar right to the neck with vodka. Be sure the vanilla beans are completely covered. 5. Close Jars. Wipe each rim with a clean paper towel and secure lid. 6. Shake. Shake each jar well to get the infusion started. 7. Allow Several Weeks to Infuse. Store jars in cool dark place, shaking as often as you can. The more you shake, the quicker they will infuse. If you will be giving these as gifts before they are done infusing, simply write the appropriate date in the "use after ______ for best flavor" spot on the gift label. 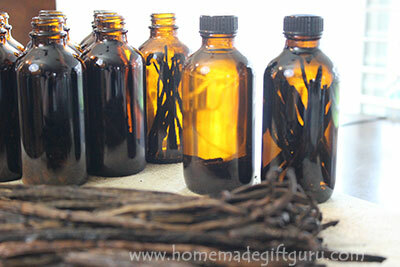 That's how to make vanilla extract! I've read right on my bag of vanilla beans, to let them steep for 6 weeks for best flavor. Though it may be usable at this point, it will continue to get stronger and richer with age, so I guess it depends on your personal taste. One thing that will effect the strength of your vanilla is how often you shake the jars. Since these are gifts, I usually put the "best after date" at least 2 months (sometimes even longer) from the date I started the infusions. The vanilla "tip tags" I made explain that the infusion will continue to increase in strength as the beans steep. They also explain that the vanilla can last for many many years if you keep adding vodka as you use the vanilla. Wondering what I mean by lasts for years and years? The shelf life of vanilla is explained well here. It should last indefinitely with proper storage. More tips for how to make vanilla extract: Vodka is the alcohol of choice when making extracts because of it's neutral flavor. 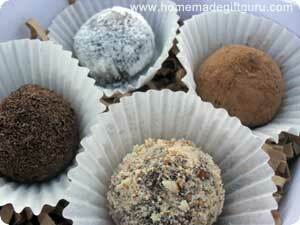 If you are feeling adventurous, you can trade out the vodka for brandy or rum. You can also add just a splash of something different. Wondering how to make vanilla extract that is Gluten Free? It's super easy! First of all, most mid-range to high quality plain unflavored vodka is already gluten free (since it is made by distilling corn or potatoes)... it is important to note that some of the really cheap vodkas are now made with grain and would not be gluten free. If you are concerned with making sure your vanilla extract is gluten free you can either find out what was used to distill your vodka or choose a vodka that is actually certified gluten free. I use plain unflavored Smirnoff, which is not actually certified gluten free, but is known to be gluten free, since it is made by distilling corn and has no added ingredients that gluten could be hiding in. Use a paper punch to pop these round tags out in seconds! 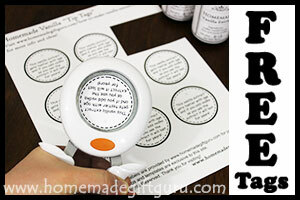 ...As shown, you can punch the instructions out in seconds using a 2" round craft punch like this one... I prefer it over others because you can see exactly what you're punching. 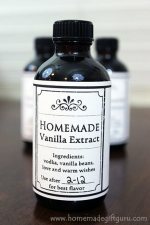 You may also like to learn how to make vanilla extract in big batches, ensuring that you have plenty of vanilla for your baking needs and for homemade hostess gives throughout the year. 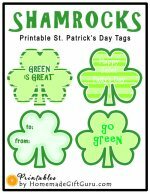 These free printable gift tags are perfect for homemade gifts!